In addition to the knowledge we gleaned from the above sites, we were also able to lean a little on our own past experience. 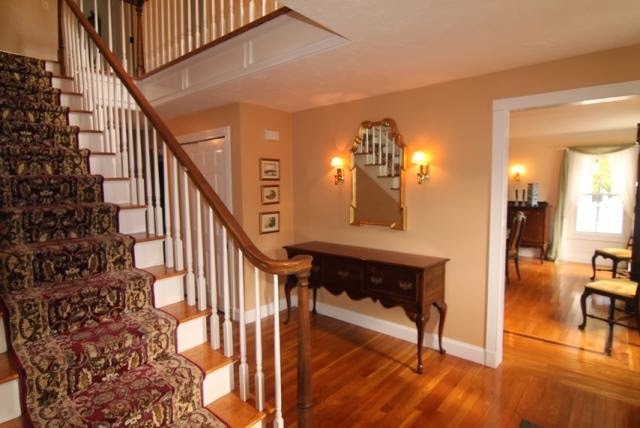 We did a stair project in our very first home in Michigan many years ago. While that project was less involved, consisting mostly of some touch up, sanding, hole-filling and applying fresh polyurethane, it did give us a feel for how to go about our new project--and very importantly it taught us the crucial lesson of never applying a coat of polyurethane to white paint (we found out the hard way that doing so turns the nice white color into a not-so-nice shade of yellowish-white). And of course, despite all the best research and preparation, you can't do a project like this without learning a few really important things along the way. 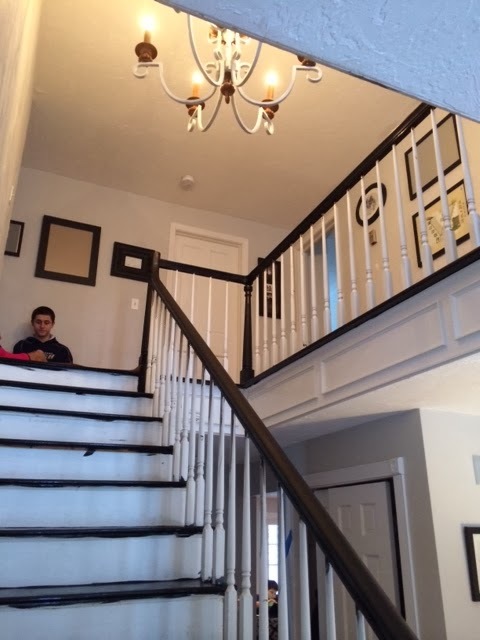 Some of the bigger lessons from our stair project were good, and some of our learnings fell more into the bad "unexpected and unwelcome twists" category alluded to above. 1. There really is such a thing as fast-drying stain. 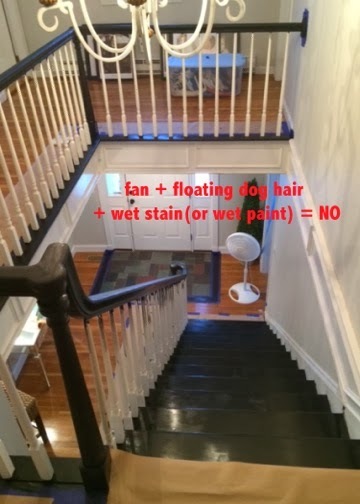 This was unclear from our prepatory research, and most of what we read beforehand led us to believe that drying times for any stain would be unaccomodatingly-long for a family of 6 with endless needs to go up and down the stairs. 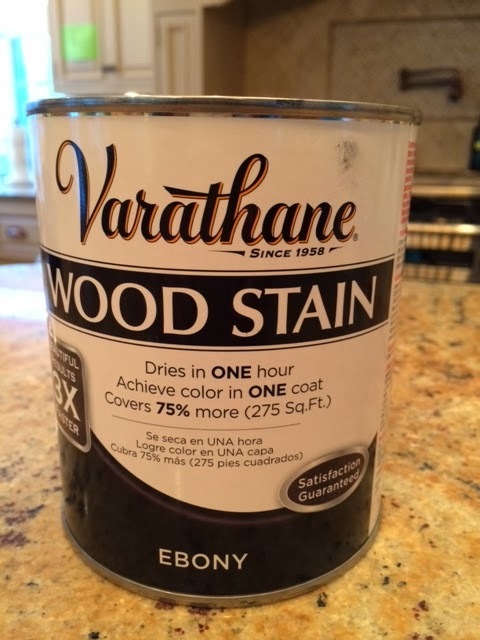 We didn't run across anyone specifically recommending Varathane brand stain, but that's what we ended up using in Ebony the darkest color they had at Home Depot. 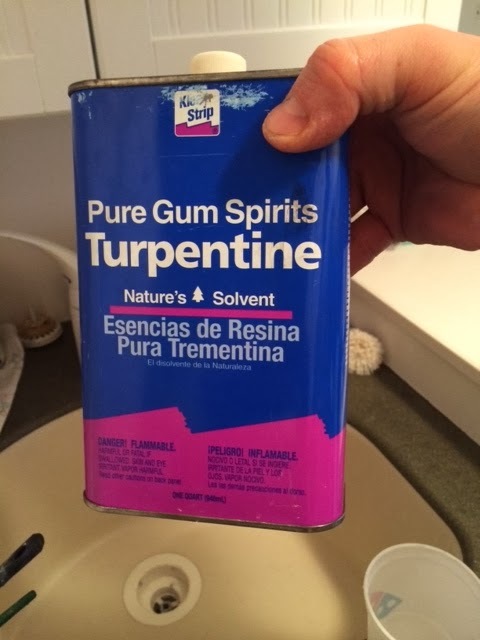 As a side note here before we continue talking about the stain... the products mentioned here are all oil based so clean up has to be done with good old turpentine. Back to the stain... this brand advertises a very fast drying time of roughly 2 hours. And after all was said and done, I would agree that the drying time is in fact just about what the can says. More on that in the "unexpected and unwelcome twists" section below). 2. There really is such a thing as fast-drying polyurethane, and you DON'T need to sand in between polyurethane coats. This also was unclear from our prepatory research, and from our trip to Home Depot to buy our supplies. 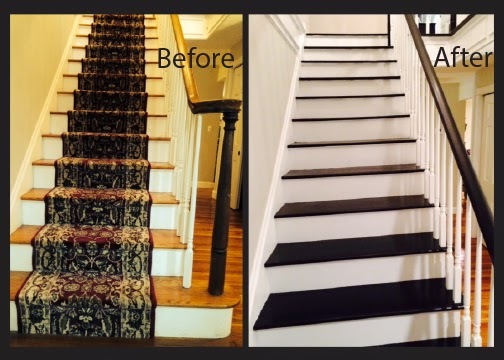 Most of the polyurethanes in the store advertised very long drying times (up to 12 hours), and when considering the multiple coats needed especially for a high-traffic area like stairs, this seemed almost painfully impossible to manage. But along came Varathane, to the rescue. 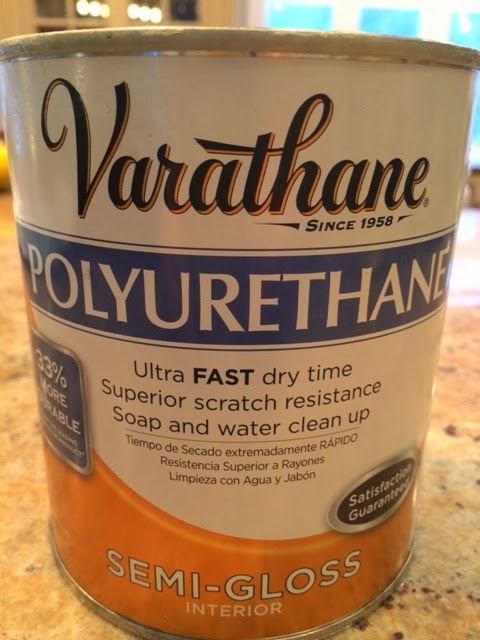 Varathane polyurethane advertises a 2 hour drying time and no need to sand between coats, as long as you don't wait too long in between coats to apply the next coat. We found both of these claims to be true: It dried much faster even than the 2 hours advertised, and with no sanding whatsoever in between coats it turned out looking perfect! 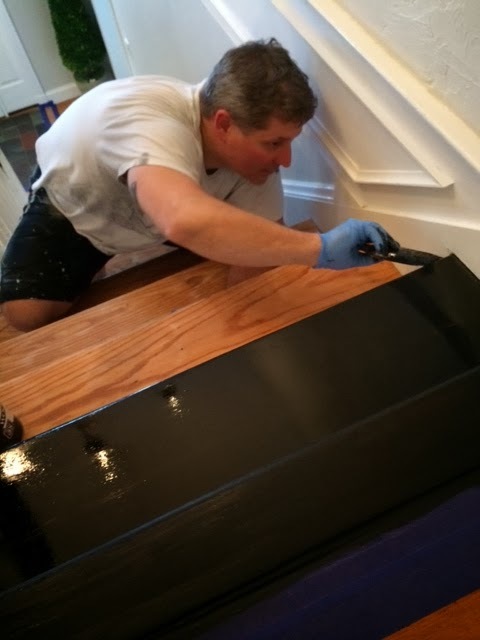 We should also mention that, given the extremely quick drying time, we decided to disregard the can's instructions to not apply more than 2 coats in a day. 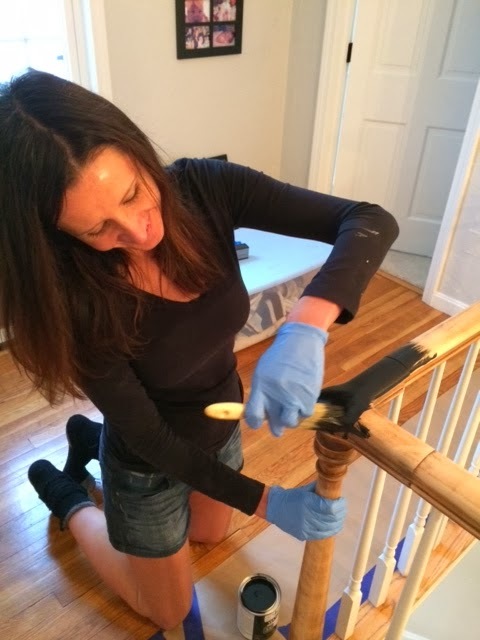 We waited a little longer (maybe 3 or 4 hours) to apply our 3rd and final coat, but easily got 3 coats on the stairs and 2 on the rails in a single day with time to spare. Allow to penetrate for 2-3 minutes then remove excess by wiping with a rag in the direction of the grain. Removal of all excess material is essential to ensure proper dry time and proper adhesion of topcoat. (bottom: 1/4 Sheet Pad Sander, top: 40, 60, & 100 grit sandpaper for 1/4 Sheet Pad Sander, Right: 100 grit sandpaper for sanding by hand, bottom: Bottom (masks): for sanding, right top: Wood filler, for filling the holes after we pulled staples and mails from runner out of the wood steps, tools: (left to right) hammer, nail puller/pry bar, screwdriver & needle-nosed pliers. & we taped and preped the stairs. We then liberally (see the mistake?) 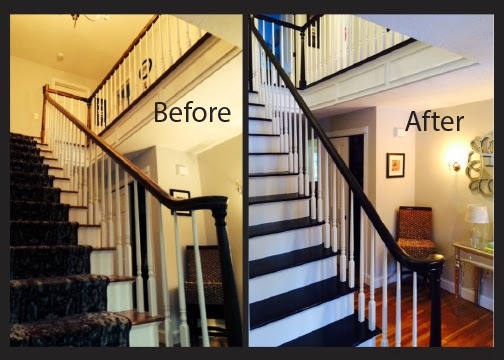 applied Varathane Ebony stain to the stairs, and they look beautiful. to allow them to be walked on without upsetting the still-drying stain finish. Dave showers, then discovers that the masking paper idea was a bad one. Dave peels back the masking paper to find his footprints in the stain, and to discover certain steps where the masking paper does not peel back without leaving much of itself behind, stuck--no, embedded--in the stain. Colette reads Dave the instructions on the back of the Varathane stain can, in their entirety, and in so doing she discovers the extraordinarily tiny but absolutely critical warning that informs us our approach of applying the stain "liberally" was a bad one and likely the culprit behind the endless drying. 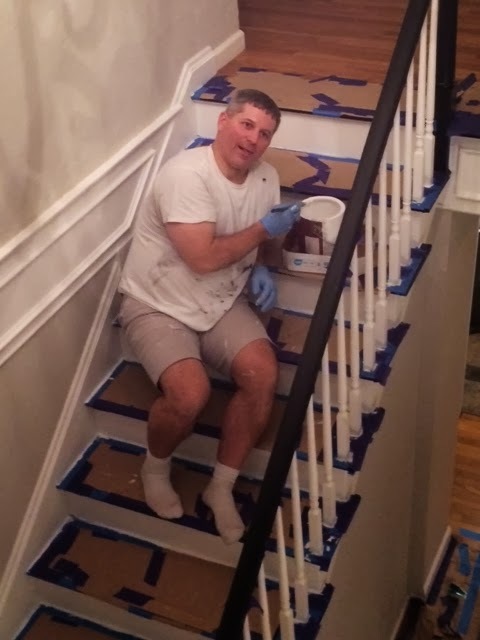 Dave scrapes masking paper off of stairs, then get stain brushes back out and painstakingly and with great force brushes back over every step to work the stain in as much as possible and to smooth over all of his footprints and the gouges he made in removing the masking paper embedded in the wet stain. Stain finally dries. 2. 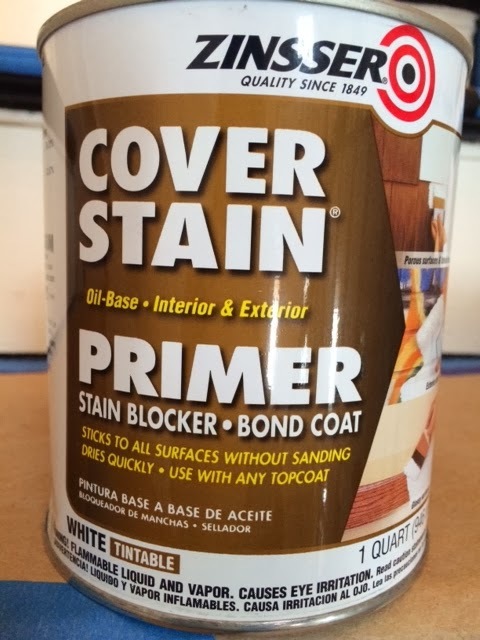 Zinsser Cover Stain Blocker should be re-named Stain "Kind of Block" Primer. because we had read about how well stain block primer worked to cover up wherever stain got onto the white during the staining process. Maybe we are just too messy, or maybe stain block just can't handle US a shade of stain as dark as the one we used, but needless to say the priming and painting of all the white trim and posts took way longer (and way more coats in spots) than expected. 3. 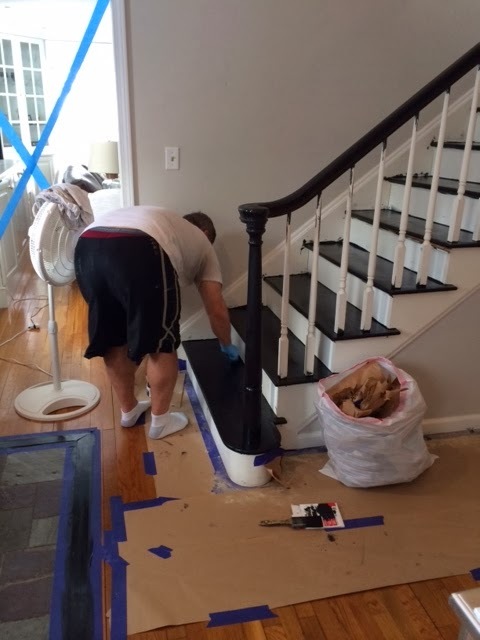 Sanding the stairs thoroughly before staining is really important for 2 reasons. 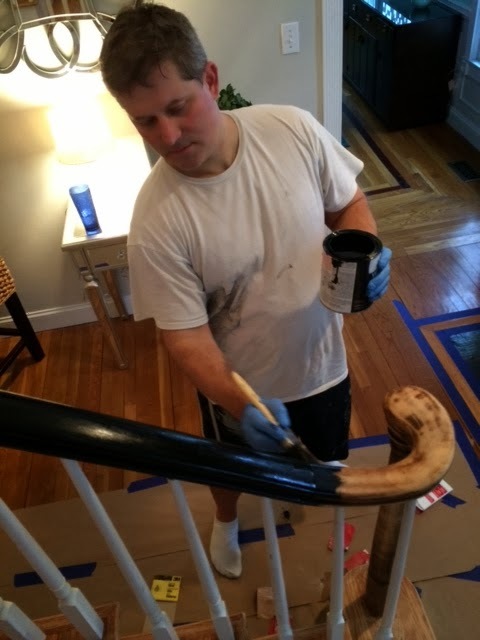 First, if you don't sand the stairs thoroughly you will leave spots with the previous finish/topcoat intact, and the new coat of stain you apply will not absorb into the wood and adhere properly in those spots. Second, if you don't sand the stairs thoroughly you will have to re-sand the stairs, at least in parts. 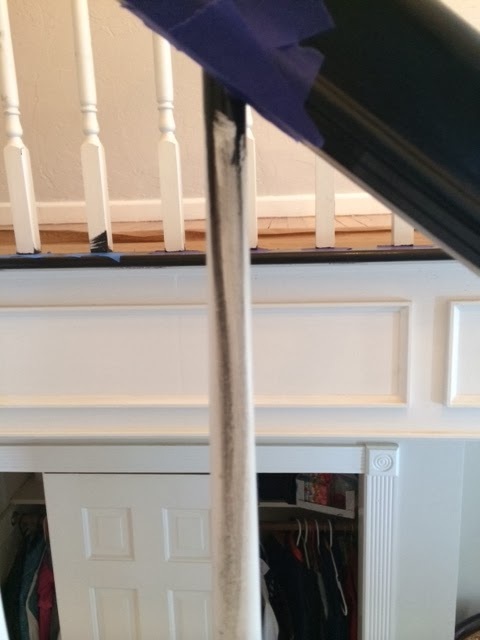 Sanding a stairway, especially with an electic sander, creates huge amounts of sawdust that gets all over everything, across several rooms all around the stairway. In our case we thankfully realized we hadn't sanded thoroughly enough BEFORE we started staining, but this did nonetheless create an unnecessary 2nd round of sanding and along with it, an unnecessary round of sawdust cleanup. to blow on the stairs in an effort to speed up the drying process, is not nearly as good of an idea as it may initially seem. Especially if you have a Pug or other domesticated animal in your home that is prone to shedding. Wet stain, dog hairs, air circulating on and around the wet stain...you get the picture. And no great tips on how to clean this one up. Anyway, despite a few bumps in the road, all in all this project sailed along pretty smoothly. 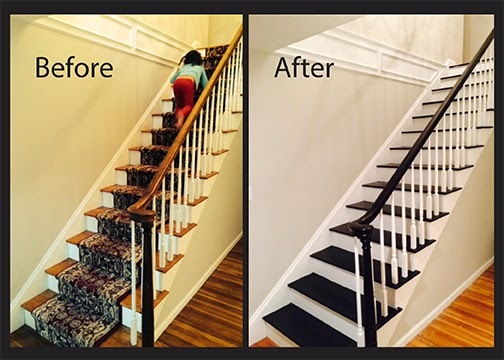 We still have a few touch-up items to finish, like caulking in a few spots and doing a little touch-up of both the stain and the white in a few places, but in the end we think the project turned out great and we're really happy with the way our brand new staircase looks!